I've spent a decent amount of time reviewing the remaining Magnum products on this blog. 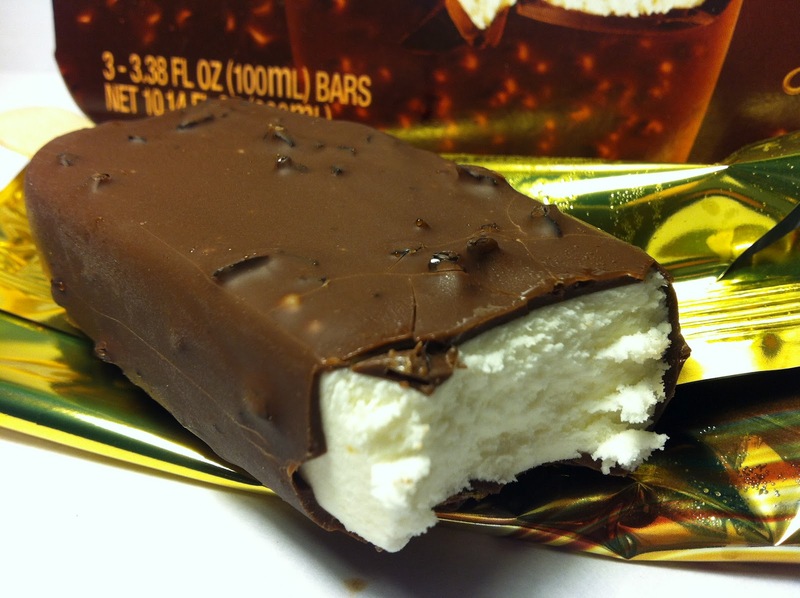 Being that I want to be all encompassing...actually, that's not true...being that I have an absurd sweet tooth, I felt it was time to review the Magnum product I've been holding out on the longest with this review of the Magnum Mint Ice Cream Bar. My dislike of mint and chocolate mixed together has kept me from this one for a long time, but as I've done more reviews on this blog, I've found that I don't hate that flavor combination as much as I once did. In fact, I actually have liked it in a lot of instances, so I was curious to see if that applied to this as well. I picked up a box of three of these at Kroger on sale for $3.00 and each bar comes in at a weight of 2.7 ounces and has 250 calories. According to the Magnum website, this is one of their "Gourmet" flavors, so the real question of this review is, how gourmet is it? 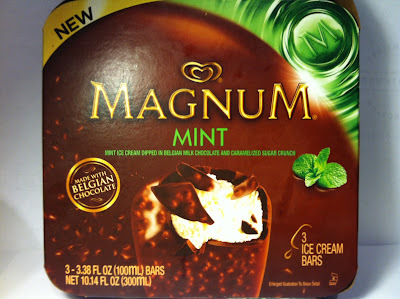 One of the places this bar differs from the majority of the Magnum bars is that the base ice cream is a different flavor this time as the interior of this bar is "creamy" mint ice cream, thus the name of the bar. In terms of smell, it had a mild and pleasing mint smell, so that was encouraging. The exterior of the bar was covered in the typical Belgian chocolate with the added bonus of caramelized sugar sugar crunch bits spread throughout the hardened Belgian chocolate. Outside of that, it was on the usual goofily shaped stick with the branded "M" logo, so there's not much else to talk about here. When I took my first bite in, I was struck by how cooling the flavor of the mint ice cream was. In fact, it was downright delicious. Not strong and overpowering, but mild and light like a peppermint candy piece. When mixed with the typical heavy and creamy Belgian chocolate, the mild and light ice cream and the sweet and heavy chocolate worked together in perfect harmony. Adding a different textural component to the bar was the caramelized crunch pieces that while they did not add any flavor, they did add additional crunch and made this almost like a mint flavored Nestle Crunch ice cream bar, which was kind of fun. Buy It or Fly By It? After dreading this flavor and holding out for the longest time, I found myself ashamed of that after this review because I really liked this bar and give it a BUY IT rating. It's not my favorite of all the Magnum flavors that I've covered, but it is definitely a good one and one that I would certainly encourage anyone to try out. Who knows, you may find this to be your favorite flavor and honestly, that wouldn't surprise me to hear that from anyone as I could definitely see that.